Halloween drinks run the gamut of disturbingly realistic (surely that’s not actual blood in the punch bowl?) to delightfully kitschy. However, no matter how cute or gruesome the drinks at a Halloween party look, they almost always contain alcohol, which is a hard pass for those of us who don’t imbibe. Thankfully, all you need to get in the Halloween spirit is a fun costume, your squad, and a bag of your favorite candy—no alcohol required. But if you’re going the extra mile and throwing a party this Halloween, a selection of non-alcoholic drinks is a must, because nothing makes people thirstier than chowing down on mini chocolate bars. Whether you’re craving something sugary to celebrate in true trick-or-treater fashion or need a drink that’ll cleanse your palate in between bites of candy, this list of Halloween mocktails has something for everyone. Channel your inner Sanderson sister and whip up a batch of this Hocus Pocus Punch. Lucky for you, the ingredients for this drink are simple and can be found at any store—no oil of boil or dead man’s toe needed for this recipe! Make this drink by the glass or multiply the recipe as needed and serve in a large punch bowl. This mocktail is essentially fall in a cup, and I’m all for it. It uses an unlikely combination of pomegranate juice and apple cider, plus a splash of soda water to add some festive bubbles. The tartness of the pomegranate juice blends nicely with the sweet apple cider for a truly unique flavor. Pop a lime wedge into each glass to really impress your spooky guests. This Golden Glow Water is jam-packed full of good-for-you ingredients. Spicy ginger, turmeric, and cayenne are balanced nicely with a drizzle of honey and molasses in this easy mocktail recipe. To make this drink a little more interesting, top it off with some kombucha or your favorite sparkling water and garnish with an orange slice. A healthy mocktail likely isn’t at the top of your Halloween wishlist, but no one said you couldn’t pair this drink with a few mini candy bars! Did you really throw a Halloween party if there wasn’t at least one Harry Potter reference on the menu? This pumpkin butterbeer is essentially a butterscotch hot chocolate that’s been topped with homemade whipped cream and drizzled with more butterscotch sauce. Didn’t dress up as Betty Crocker this Halloween? No worries, you can always buy pre-made whipped cream and butterscotch sauce at the store instead of making it yourself. This fall-inspired sangria features citrus green tea and non-alcoholic sparkling apple cider. When combined with the fruit slices and cinnamon sticks, this sangria turns a light orange color that’s perfect for any Halloween party. To prevent the sangria from getting watered down, freeze some of the green tea in an ice cube tray to keep your drinks cold. Nothing says ‘Halloween’ quite like a mocktail that’s pure sugar. To make this Gummy Bear Mocktail, rim each glass with sugar, then pop a few gummy bears into the bottom of each glass (you can also use gummy worms or any other Halloween gummy you’d like). Then, top off each glass with sparkling apple cider and start sipping. For the full effect, slide a few gummy bears onto a swizzle stick and put one in each glass. Don’t let the name of this mocktail fool you, there’s nothing pumpkin about this drink except for a few spoonfuls of obligatory pumpkin puree. However, this mocktail’s cheerful orange color make it perfect for Halloween. Sparkling apple cider is mixed with pumpkin pie spice and served with frozen peach slices for a unique fall drink your guests will want a second glass of. When the clock strikes midnight, make a batch of virgin margaritas à la Practical Magic. 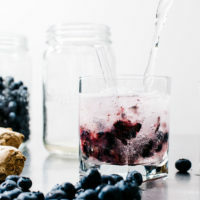 This vegan drink recipe uses just five ingredients and can easily be prepared for a crowd. To make this mocktail paleo-friendly, omit the orange blossom water and use a little extra orange juice instead. This three-ingredient punch tastes just like the stuff your grandma used to make for family holidays. Lemon lime soda, grape juice, and sorbet make for a refreshing drink that can double as dessert. Because sorbet melts quickly, wait to prep this punch until the last minute. This blood red punch gets its vibrant coloring from a mixture of fruit punch and Red Hot candies. Serve this mocktail straight from the slow cooker, or pop it in the fridge for a few hours and serve chilled. To make this drink spookier, fill up a rubber glove with water and freeze it to make a giant ice cube in the shape of a hand. Your scary punch bowl is sure to be a hit! If you can’t decide which of these Halloween mocktails you want to make, just buy some apple cider and pop a cinnamon stick into each cup when you serve it. Festive Halloween drinks make for a fun centerpiece, but no one will complain if you stick to a classic fall beverage. After all, your friends are at your party for you, not the drinks!